Honestly I do not know for sure if this recipe actually comes from Bali Island. 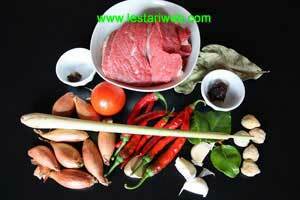 In fact this dish is very popular in Java, particularly in eastern region. This side dish seemed to be a mandatory recipe for selamatan or communal feast. A slametan can be given to celebrate almost any occasions, including birth, marriage, death, moving house, and so forth. As I recall as a child, when my parents and all my neighbours have the above mentioned intention, they will send us a takir or a banana-leaf container, stuffed with rice & each sort of side dishes. The side dishes are generally consisted of: Mie Goreng, Sambal Goreng Kentang Hati, Kering Tempe and Daging/Ayam/Telor Bumbu Bali. I have memorized this recipe by heart because as I remember in my childhood time, my brothers and I often compete & fight over the "Takir". 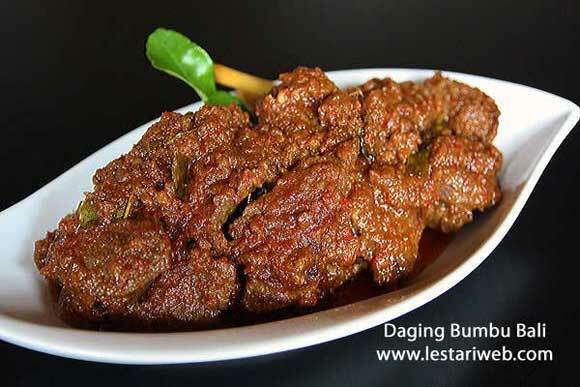 Who were fast enough will be awarded of course with "Daging Bumbu Bali" ha ha ;-). Note : Instead with beef you can prepare the dish with chicken or boiled eggs. Cut or slice the beef into a thinly rectangular shapes. 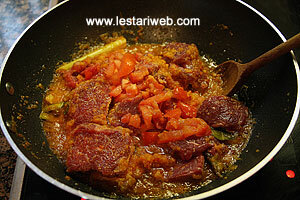 Add the beef & chopped tomato. 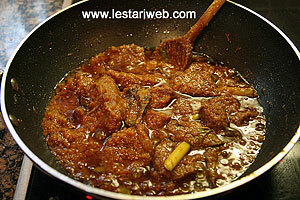 Stir and cook until the beef colour turns to white. Add the hot water *** & adjust into medium heat. 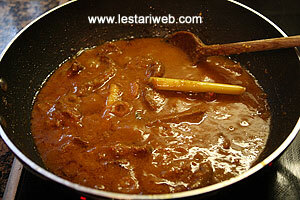 Simmer for approx 20 minutes until the water is absorbed and the beef is well cooked. Stir occasionally. 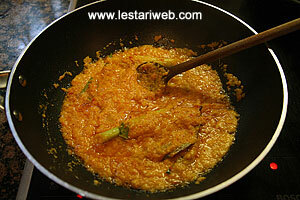 Add the tamarind water & kecap manis, stir to mix. Adjust the seasoning, add salt & sugar to taste. Serve hot. *** Add the boiled /hot water into the meat then cook on the medium heat to preserve it's best taste. You may cook this dish one day in advance, store in the fridge (leaving the leaves in). It lets the flavors absorbed perfectly and tastes more delicious.